A photograph is an image made by a photo-chemical reaction which records the impression of light on a surface coated with silver atoms. The reaction is possible due to the light-sensitive properties of silver halide crystals. In 1556, the alchemist Fabricius was the first to discover that light can photochemically react with these crystals to change the silver ions (Ag+) to elemental silver (AgO). As the reaction proceeds, the silver atoms grow into clusters, which are large enough to scatter light and produce colors in a pattern identical to that of the original light source. Photography utilizes this chemical principle to record color and black and white images. Silver salt chemistry remains the preferred method of recording high quality images, despite advances in electronic technologies and digital imaging. One of the first researchers to produce photographic images using silver halide chemistry was Schultze. As early as 1727, he formed metallic silver images by first reacting solutions of silver nitrate and white chalk and then exposing these solutions to light through stencils. Schultze's work was improved upon through the efforts of Louis Jacques Mandé Daguerre who, in 1837, developed a process for printing images on a silver coated copper plate. This type of printed image, called a daguerreotype in honor of its primary inventor, is made by polishing and cleaning a silver-coated copper plate and then reacting the silver coating with iodine vapors to form light-sensitive silver iodide. The silver iodide coated plate is then exposed to light through the optics of a camera that projects and focuses an image on the plate. In the ensuing reaction, the silver ions are reduced to silver metal. Finally, the plate is treated with mercury to produce an amalgam. In this type of print, the areas of the plate exposed to light appear white and the unexposed areas remain dark. The problem with this method was that it required long exposure times because the intensity of the image depends solely on the strength of the light forming the image. In 1841, William Henry Fox Talbot overcame this problem by developing a quicker method that did not depend entirely on reflected light to produce the image. He found that silver halide could be exposed in such a way so as to produce a preliminary latent image which required only a small amount of light. This latent image could then be subsequently reacted, without additional light, to produce a final image. Using this technique, known as calotyping, Talbot was one of the first to produce continuous tone images. Unfortunately, these early images were not stable and darkened over time. Fortunately, around the same time Talbot did his work, John Frederick William Herschel discovered a way to stabilize images. 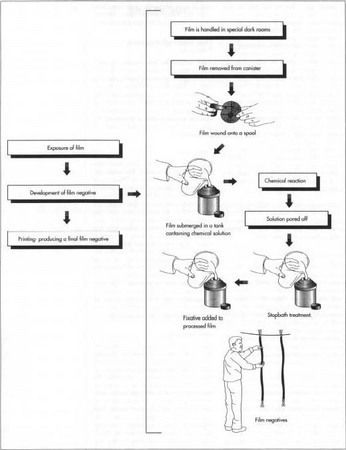 His process, known as fixation, chemically converts unexposed silver halide to silver thiosulfate, which can easily be washed off of the image. The next major advance in photography came with the discovery that certain materials could enhance the sensitivity with which latent images are formed. This enhancement is achieved by coating the silver halide crystals with chemical agents, such as sulfur and gold, which increase the light sensitivity of crystals. Gelatin, which for years had been used as a photographic coating agent, was found to be an effective medium for these light-sensitive materials. In 1888, George Eastman, who pioneered modern film development, coated gelatin-dispersed silver halide crystals onto celluloid sheets. By the next year, Eastman had commercially sold rolls of films prepared by dissolving nitrocellulose with camphor and amyl acetate in a solution of methanol. In the last century, both film processing and camera equipment have improved considerably but these same basic principles are still used to make photographs today. Modern film is made by coating light-sensitive ingredients onto a flexible plastic surface. This is a complicated process because a typical roll of film may contain as many as 15 different layers. The first step in the process is to grow microscopic silver halide crystals from silver nitrate and halide ions. After the crystals are grown in solution to a certain minimum size, they are separated and mixed into a gelatin base. This mixture is washed to remove sodium, potassium, and nitrate ions and the resulting silver halide/gelatin emulsion is chilled and allowed to gel. This emulsion is both light and temperature sensitive and must be carefully stored. The emulsion is later melted and the silver grains are coated with chemical agents to enhance sensitivity to certain wavelengths of light. In its molten form, the emulsion is coated onto a support structure, usually a polymeric film. The original film used by Eastman was made from cellulose nitrate and was extremely flammable. Modern film uses solvent-based materials, like cellulose triacetate, and extruded materials, like polyethylene terephthalate. These plastics are safer, stronger, and more chemically stable. As an alternative to plastic film, coated paper is used for some specialty photography. 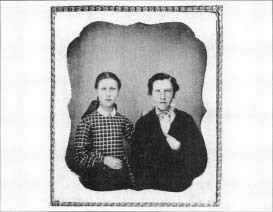 An example of a daguerreotype photograph. The daguerreotype was the earliest commercial photograph available to Americans. Named for Frenchman Louis Daguerre, who perfected this photographic process in 1837, the daguerreotype was produced directly on coated metal without a negative. The daguerreotype was easily made in the mid-1800s. Photographic plates were copper faced with silver, polished with flannel and rottenstone, taken to the dark room to be sensitized (coated with thin layers of bromine and iodine). The coated plate was then put in a plateholder and exposed in a camera. The plate was developed in a dark room placed face-down in a vessel filled with mercury at about 120° F (48.°c C). Then, the plate was fixed by washing it a solution of hyposulfite of soda, removing the remaining iodine and bromide. The plate was washed and gilded or toned (some were hand-tinted with color) for that exquisite image. After 160 years, the daguerreotype remains unsurpassed for its clarity and precision of image. Some claimed that you could count the hairs on the head of the subject, while others complained that the daguerreotype unflatteringly revealed every line and wrinkle. This daguerreotype was likely commissioned by a mother in order to remember her beloved daughter and son just before the Civil War. Others captured houses, farms, siblings, laborers, famous politicians, children alive and deceased, and even scantily-clad prostitutes in these early Victorian photographs. One common method for coating these plastic films is to dip them into a trough or tray containing the molten emulsion. As the film exits the trough, excess liquid is removed by a knife edge or air jets. Another coating method runs the film below a hopper filled with the emulsion. As the film passes under the hopper, the emulsion is dispensed onto the film. After coating, the emulsion is spread evenly on the film with rollers and is transported to a cooling chamber where the emulsion gels. Finally, the film is sent through a heated chamber which dries and hardens the emulsion. Multiple layers can be coated onto the film in this fashion and specific coatings can be added in order to control how light is reflected/absorbed. Additives used for this purpose include small carbon particles, dyes, or colloidal silver. The last layer is a gelatin overcoat, which seals the film and holds the lower layers in place. In general, the thicker the layers of the emulsion and the larger the silver crystals, the more light sensitive the image. Light sensitivity is gauged by a number known as the ASA (American Standards Association) rating. A low ASA rating means more light is required to record an image; a higher number means less is required. For example, film with an ASA value of 100 (commonly referred to as 100 speed film) is for use in bright sunlight or with a flash. Higher speed film, such as 200 or 400 is more suitable for pictures taken indoors or on overcast days. After manufacture, film is typically wound onto spools and packaged in light-proof containers. These containers are designed to be opened and loaded into the camera without exposing the film to light. The chemicals used in developing are designed to grow the microscopic silver atoms into silver centers that are larger enough to be visible to the unaided eye. These developer solutions are composed of reducing agents, restrainers, and preservatives. Hydroquinone is one common reducing agent used for used for black and white film. Bromide ions are commonly used as restrainers, which move the reaction in the opposite direction. Preservatives are added to the mixture to prevent premature oxidation. Sodium sulfite is typically used in this regard. Printing images requires special paper, which is coated with light-sensitive materials. This paper is available in different grades, which vary smoothness and shine. Printing also requires an enlarger to increase the size of the image and developing and toning solutions, which help control its intensity and color. In addition to the materials described above, developing and printing operations require a variety of equipment such as trays, measuring glass ware, thermometers, drying screens, timers, mixing pails and stirring paddles, and paper cutters. There are three key steps involved in making a photograph: exposing the film to light, developing the image, and printing the photograph. While there are other types of photographic films, such as polaroid and slide films, and other mediums in which to develop photographs, such as film and digital images, the general process of developing 35mm film into photographic prints is discussed here. 1 Once the film is loaded inside the camera it is ready to be exposed. The camera optics focus an image through the lens and onto the emulsion grains. The camera controls the light through a combination of the size of the opening in the lens (the aperture) and the length of time the aperture stays open (the shutter speed). A wide variety of exposure effects can be achieved by varying these two factors. The reaction between the emulsion and the light forms a latent image on the film. The focal length of the camera lens determines the magnification of the latent image, while the penetration of light into the film depends on the combination of lens optics and the chemical properties of the film. The image formed is a negative, meaning it is opposite of how it is seen by,.the eye. In other words, the areas touched by light are dark and the unexposed areas appear light. Once removed from a camera, exposed film is submerged in a tank containing a solution of developing chemicals. This solution reacts with the exposed areas of the film to amplify the light impressions of the latent image. After this stage is complete, the solution is poured off and a stop bath treatment consisting of dilute acetic acid is added to the tank to prevent the film from overdeveloping. After the development is stopped, a fixative can be added to lock in the image. The finished negative then may be washed and rinsed. The reel is then removed from the tank and the fresh negatives are hung up to dry. image. This step produces a negative image, which can then be used to print a final picture. When the film is removed from the camera and taken out of its protective container, caution must be used because the unexposed areas are still light sensitive. Film is handled in special darkrooms, which are illuminated with safe red light that does not effect the film. Once inside the darkroom, the film is removed from its canister, wound onto a spool, and stored in a plastic container to protect it from light and physical damage. The film may then be submerged in a tank containing a solution of the developing chemicals described above. This solution reacts with the exposed areas of the film to amplify the light impressions of the latent image. This process produces variable results depending on the type and temperature of the developer solution used and the level of the original exposure to light. After this stage is complete, the solution is poured off and a stop bath treatment consisting of dilute acetic acid is added to the tank to prevent the film from overdeveloping. After the development is stopped, a fixative can be added to lock in the image. The finished negative then may be washed and rinsed. The reel is then removed from the tank and the fresh negatives are hung up to dry. 3 Printing is the process of producing a final image from a negative. If photography is the art of taking a picture, printing is the science of making a picture. Printing requires light, a negative, and printing paper. The light source is an enlarger, which uses a lens to focus light through the negative and project it onto light-sensitive paper. The positive image on this paper is then developed in a manner similar to that described above for developing negatives. Finally, the print may be mounted on cardboard or other backing material. Reprints (additional prints of the same image) may be easily produced in a similar fashion from either the original negative or from a previously generated print. Quality control is a critical element of the photographic process. During film production, emulsion coatings must be free from streaks and very uniform in thickness to yield a quality film. The chemistry is exceedingly complicated and is designed to ensure high quality film. Various assays are employed at each step of the film production process to ensure the finished produce is free from defects. Similar care must be used during the development and printing processes to guarantee image quality. Key areas of concern are related to the proper concentrations of chemicals and the time and temperature used in the developing tanks. If the solutions are not the right concentration, the negative or printed photograph may be over or under processed, leading to ghost images or over exposed areas. During processing, the developing solutions must be kept within 5° F (-15° C) or the emulsion and film may either expand or contract and produce un-wanted patterns on the picture. Although photography is a mature technology, advances continue to be made in the way pictures are taken. For example, Kodak has recently introduced a cartridge-based alternative to 35-mm film. This system allows photos of different format to be taken with the same camera, either panoramic or regular prints. Improvements also continue to be made in the automated processes used to develop pictures and have lead to the availability of one-hour photo processing facilities. The real future of photography may lie in the area of digital imagery, a computer-based technology, which produces images electronically. In the future it is likely that methods of capturing and printing digital images may rival the quality of chemical prints. In addition, computer photography offers near-instant results and the ability to manipulate the appearance of images. Bimbaum, Hubert C. Black and White Dark Room Techniques. Saunders Photographic, Inc., 1997. Harris, Ross. Making Photographs. New York: Van Nostrand Reinhold Company, 1978. Langford, Michael. The Story of Photography. Focal Press, 1997. Ray, Sidney F. Photographic Chemistry and Processing. Focal Press, 1994.
i need the photochemical decomposition of silver salt.